2/11/19 News of Planet of the Apes, with Meria. Hundreds of predators at So.Baptist Church; Calif pulls Natl Guard from border-New Mexico too; Nogales wants the wire wall removed; Amy Klobuchar; Virginia mess; Eliz Warren vs. trump; Enquirer vs. Bezos; more WH leaks; trump hated in WH; 5 gold star stories; Deutsche Bank & trump; strikes; Yemen;US weapons to Venezuela; Saudi & trump/Khoshoggi; another shutdown? ; Ilhan speaks truth to power; tax cut screws blue states; separated children; Kavanaugh & Collins; ICE;Kevin McCarthy; more defections from WH coming; another oil leak; plant closings in NY; farm bankruptcies rise; AOC is right; trump & Bezos; Melania’s friend and inauguration; drug companies; cannabis trials; Whitaker; and tons more stories. 4 Responses to "News of Planet of the Apes, with Meria"
You said, “Trump’s in bed with Pecker.” Wow! 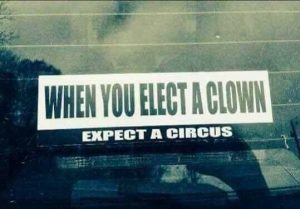 Another bumper sticker slogan brought to you by Meria Heller!! P.S. It was Rep. Hakeem Jeffries who asked Whitaker where the hell he came from. Cuts off before you are finished ; At states where farmers declared bankruptcies; just thought you’d want to know. Says I’m logged in but then won’t accept comment; when I sign in again I get your dashboard or mine; it’s just been really strange for last 3 months; sorry I didn’t let you know about this sooner.